The definition of a FIPA-ACL compliant communication specification, which has been implemented following a semi-automated model transformation workflow form a Web Ontology Language (OWL) ontology to a dedicated Mas2tering JADE ontology. With the Anonymization service designed by Cardiff University (CU) that supplies de-identification services, while accessing raw data in a trusted role from the data historical server. With forecasting services designed by Cardiff University (CU) that forecast the consumption/production of the devices via web service interface. the communication component that satisfies it. 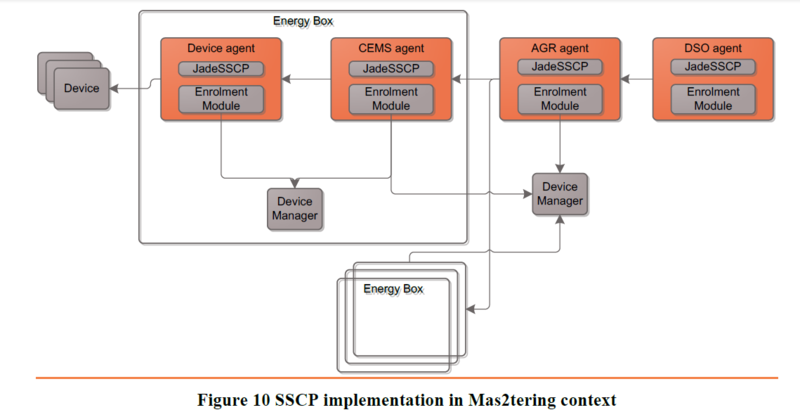 In summary, this report provides a detailed design and specifications of the Mas2tering multi-agent communication architecture. Next steps in the Mas2tering communication development work will focus on the completion of the implementation phase of the identified communication components and in particular of: (1) the Device agent that acts as interface between the Energy Box and the rest of the multi-agent platform; (2) the agent-to-agent communication protocols; and (3) the agent communication behaviors that will produce/process the content of the ACL messages. Figure 15 Anonymisation service provision. Figure 16 Anonymisation communication ontology – for the agent-based deployment. Enrolment phase: in order to be allowed to communicate, the agent needs to send an enrolment request to register itself (Figure 11). 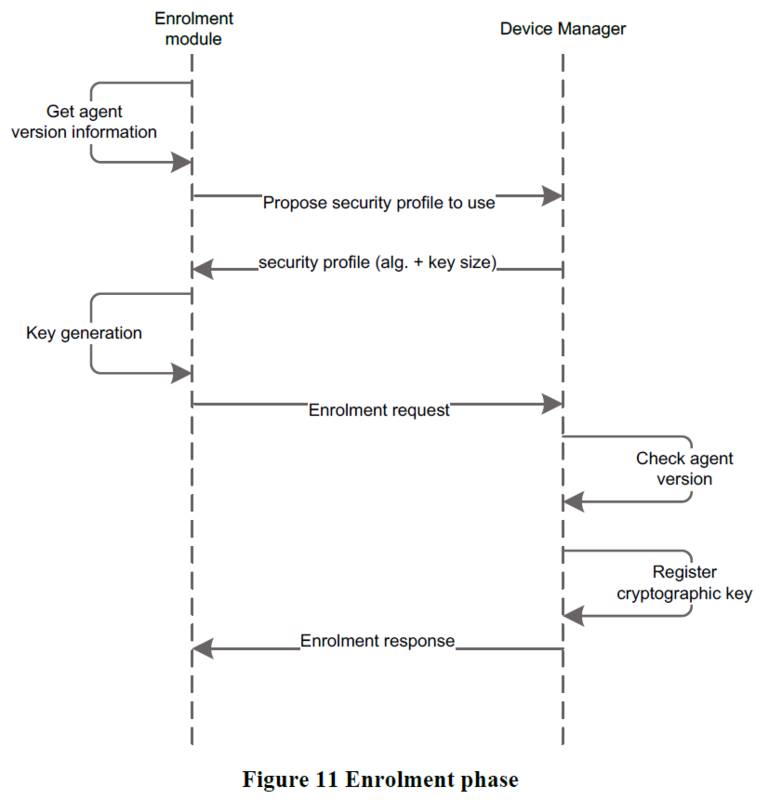 Communication phase: once the enrolment phase is finished, the agent can communicate with other agent in a secure way, with authentication and encryption (Figure 12). This document presents the design of the Multi-Agent global communication architecture for the Mas2tering project, providing the design specifications required for the identified communication components. This design process follows the adopted Gaia agent development methodology for Mas2tering, and further advances the Gaia interaction model defined in D2.2 (i.e. with the corresponding high-level interaction scheme) to define the agent communication protocols and ACL messages. The design of the Mas2tering data exchange model and a methodology to generate the messages exchanged from the Mas2tering ontology. The proposed model is aligned with relevant standards (in particular with FIPA-ACL, energy@home, CIM, IEC 61968 and OpenADR). A methodology to create automatic JADE messages is proposed including a mapping from standard vocabularies to JADE compatible source code and the definition of a JADE bean generator for automatic code generation. The communication design of the Mas2tering MAS platform integrating other non-agent communication (security, forecasting, monitoring) components. A mapping of this global architecture to the project use cases with the definition of the communication details in each use case. The specification of eleven agent interaction protocols that cover the agent-to-agent communication for the three Mas2tering use cases. The implementation of a Device agent that acts as an interface between the Telecom Italia Energy Box (i.e. running JEMMA software) and the rest of the multi-agent platform. The implementation of the generic communication components that define the global communication architecture and of the agent communication protocols (in JADE, based on FIPA-ACL) for each use case. The implementation of agent communication behaviours that will produce/process the content of the ACL messages (following the FIPA ACL Message Structure Specification), thus exploiting the JADE content language and ontology support with connection to the Mas2tering ontology. The current status of FIWARE Generic Enablers presents challenges to integrating them into the Mas2tering platform due to their continued problems of stability, reliability and maturity. Mas2tering has identified alternative components that provide more reliable and stable reusable functions. Such components include PANDA, ARX anonymization and the JADE framework. However, we include the description of the integration specifications of two Generic Enablers that have the potential of adding useful features to Mas2tering. The next phase in communication development work will include the completion of the implementation of these communication components which is already underway.